Concept Metal participates in the GLOBAL INDUSTRY trade show which takes place from 05 to 08 March 2019 at EUREXPO Lyon. of: Tungsten, Titanium, Tantalum, Vanadium and Cr3Cr2. In all forms and also according to drawings. finished parts according to plans on all these matters, and more particularly special metals. Our objective is to guarantee you irreproachable quality and service. Our reactivity and experience allow us to find the best solutions at the best quality/price ratio in these fields. 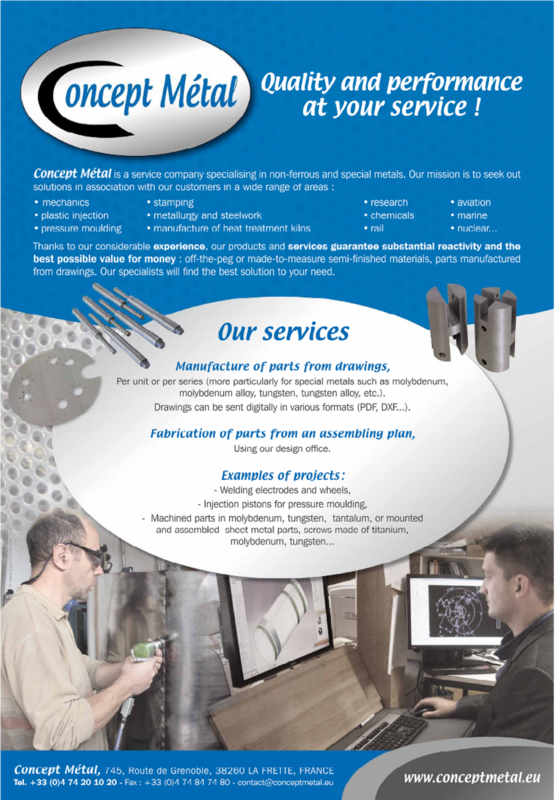 We also propose you a service "as project manager" for customized solutions.